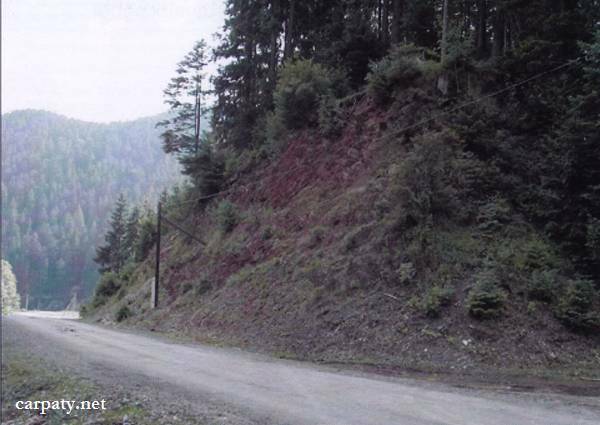 Regional Information Center "CARPATHIANS" » GOLYATYNSKE CRETACEOUS ROCKS OUTCROP. 48° 40′ 05″ N lat. 23°26′ 59″ E long. In the right bank of Golyatynka River (right branch of Rika River) in the impressive valley in outcrop more than 100 m long and up to 10 m high there is exposed the contact of Lower Cretaceous black quartzite-like sandstones and argillites with Lower-to-Upper Cretaceous bright-red and greenish argillites and marls. Rock age is confirmed by paleontologic findings (micro-fauna). 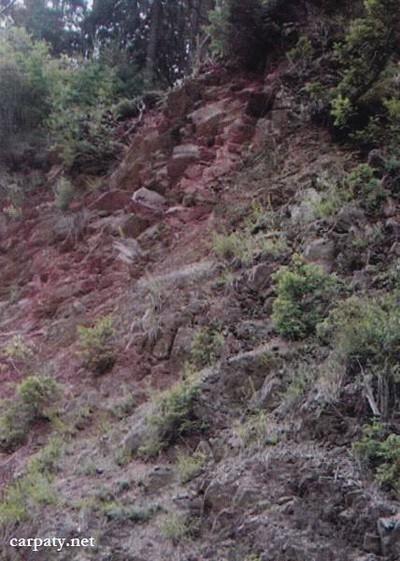 In the cliff one can see that contact is complicated by small and steep tectonic fault like inter-formation break. These breaks are often being formed at the contacts of rocks with contrasting physical properties due to tension forces in folding process. They are of great importance in the studies of Carpathian geo-dynamics.